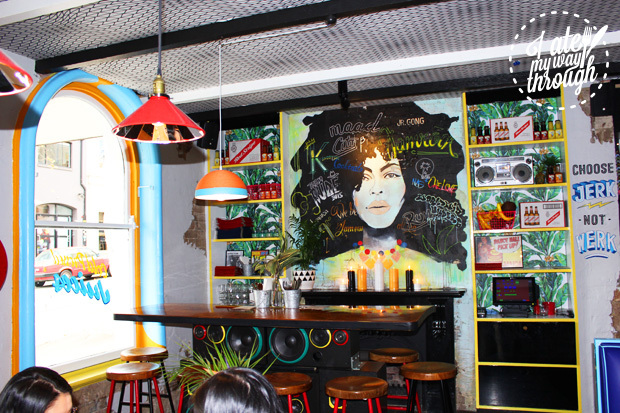 Your new Caribbean escape has just hit Surry Hills and is already drawing a crowd. 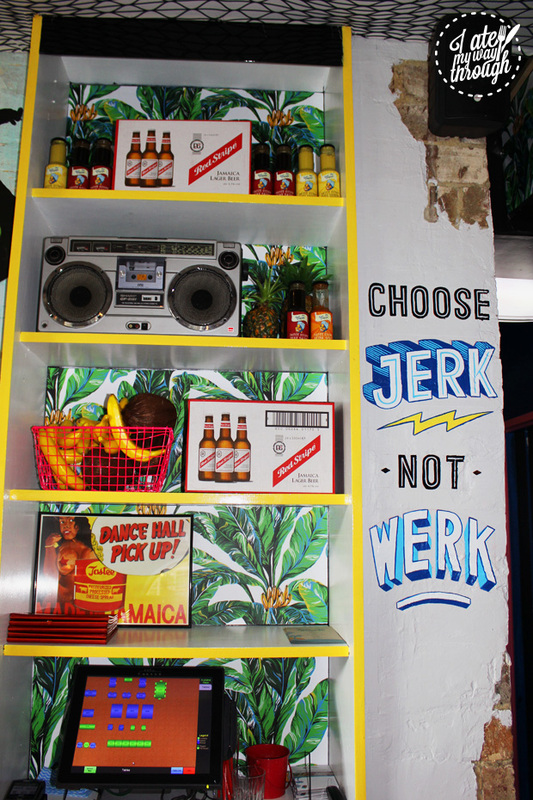 But don’t worry, there’s plenty of rum and jerk chicken to go around. 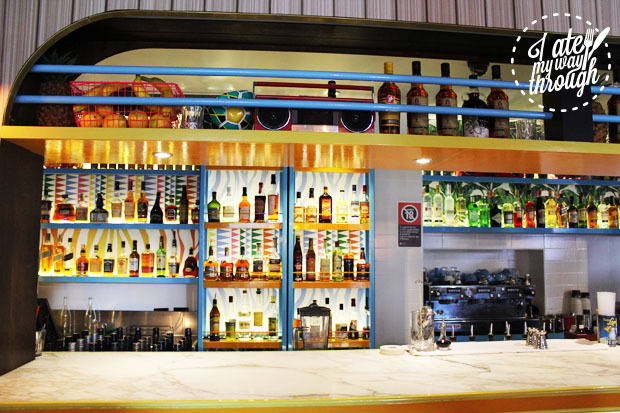 The clever people behind The Soda Factory have just opened Rosie Campbell’s, a Jamaican-themed bar with one simple motto: “Everything’s Rosier with Rum!” Open for brunch, lunch and dinner, Rosie Campbell’s is dishing up its delicious Jamaican-style menu with a side of one of its 35 different types of rum. 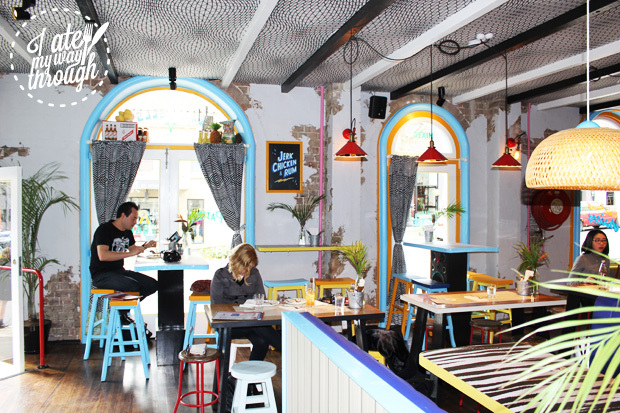 Rosie Campbell’s is proof that the success of The Soda Factory wasn’t just a fluke, with the creators once again hitting the nail on the head with food, drinks and styling. 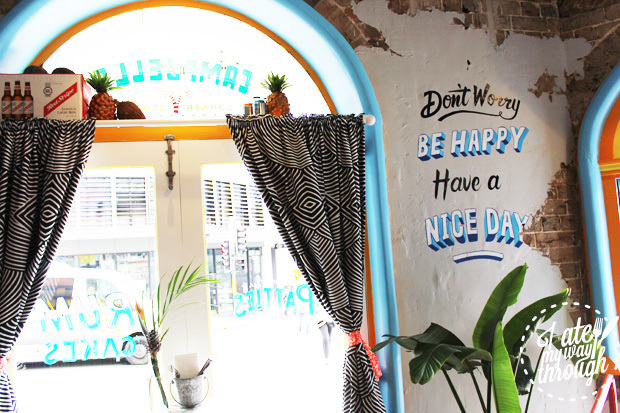 The interior is a visual feast of tropical prints, catchy phrases, block colours and Jamaican paraphernalia. All this topped off with a constant playlist of smooth reggae will leave you feeling ready for summer. 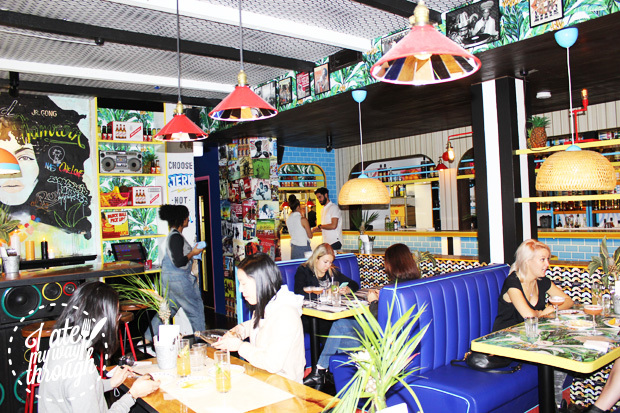 Last week, I sat down for lunch at the beach-hut diner/bar to try some of Rosie’s exciting menu. Beginning with the “smalls” share menu I tried the Kingston Corn Fritters ($13). 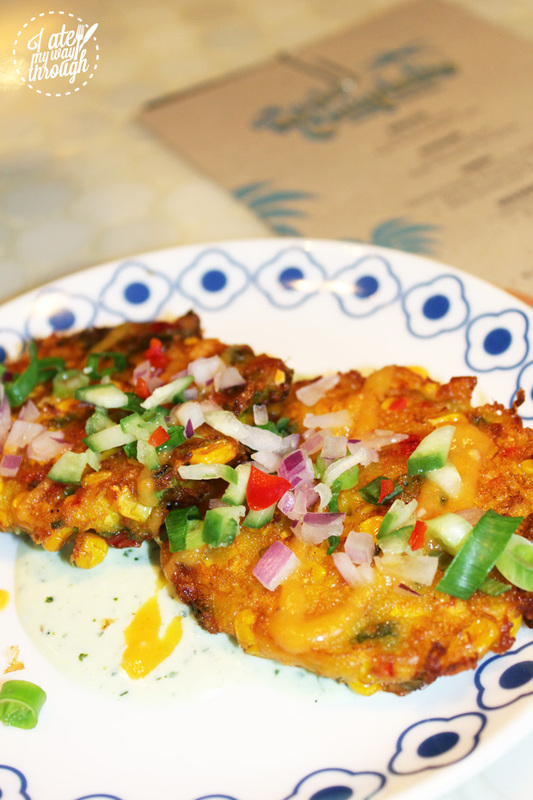 Sweet and crispy with a kick of heat, these fritters were a fantastic snack. A creamy sour cream and sweet chilli sauce was the perfect accompaniment to the already full-flavoured dish. 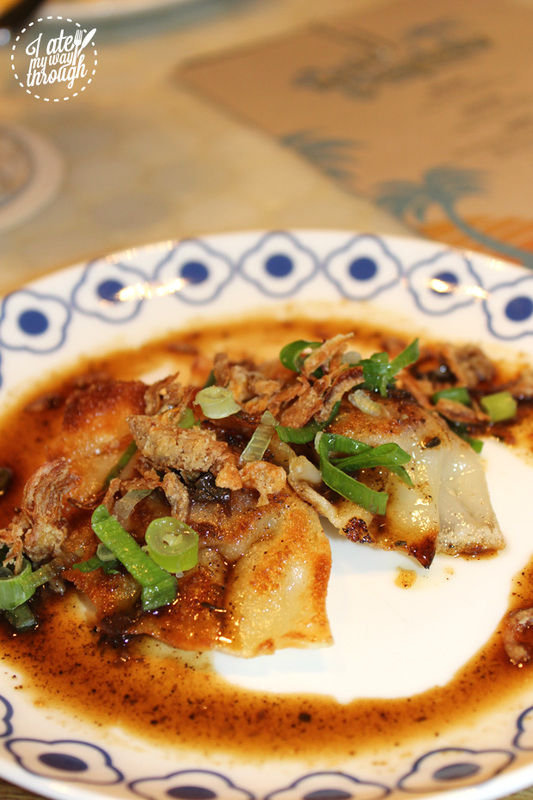 After such a spicy Jamaican dish I was surprised to see the Asian-inspired Jerk Pork Dumplings ($16) on the menu. This starter was the perfect fusion of Asia and the Caribbean with the sweetness of the jerk spices beautifully offsetting the saltiness of the chinkiang vinegar. A topping of crispy shallots added a surprising texture to an otherwise soft dish. Before moving onto the “Biggies” main menu, I washed down my starters with one of Rosie Campbell’s signature cocktails. Rosie’s Estate ($17) is made with Appleton White Rum, Tanqueray Gin, Yellow Chartreuse, watermelon, honeydew, sugarcane, Peychard bitters and topped with a dash of cinnamon. Although initially quite strong, this cocktail turned into a delightful sweet and spicy drink. 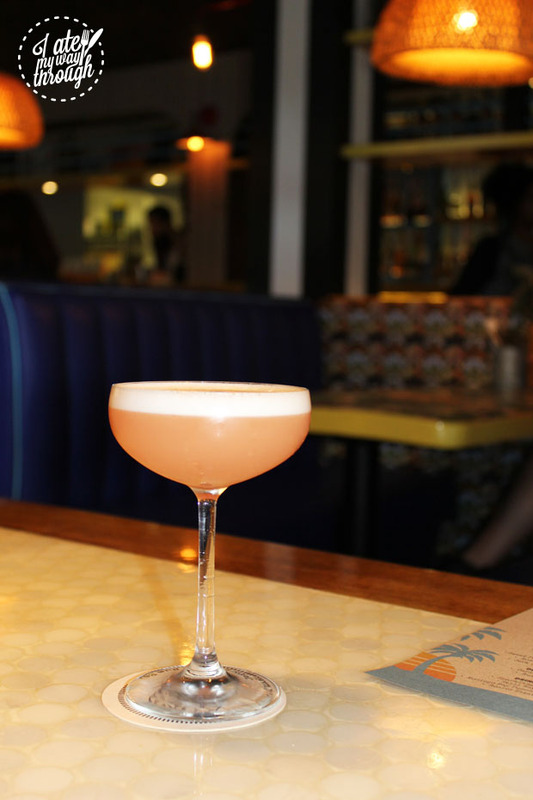 Rosie’s Estate was a perfect light and refreshing drink to accompany my mains. Although the “Biggies” menu boasted a great variety of meals, it was the El Chancho’s Cuban Sandwich ($18) that caught my eye. Filled with dill pickle, mustard, swiss cheese and house made mayo, the hero of this dish had to be the tender 6-hour slow cooked roast pork shoulder. 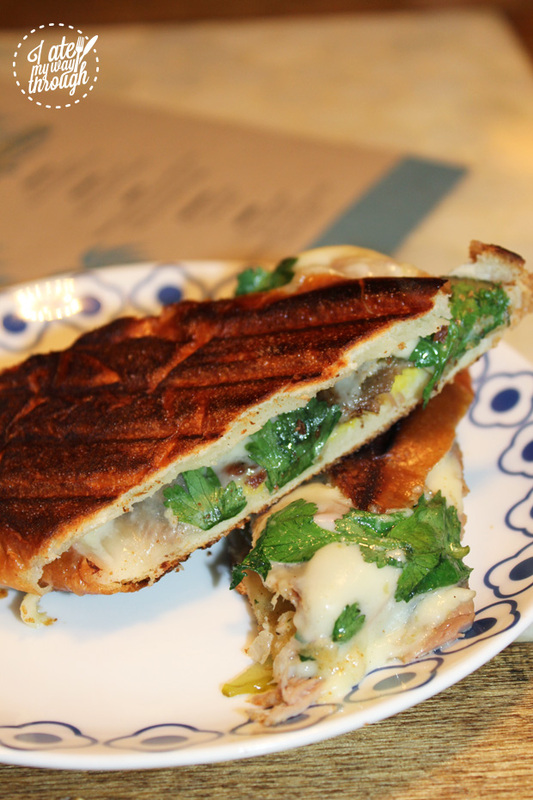 The Cuban Sandwich definitely wasn’t one of your average toasted-cheese sandwiches, that’s for sure. In the mood for some more jerk spice, the Grilled Jerk Chicken Burger ($16) was something I just couldn’t miss. In order to save some space for dessert I was given the burger in the form of a slider. Just like it’s older brother, the slider was topped with sunshine slaw, dill pickle, crispy fried shallots and habanero pepper sauce. 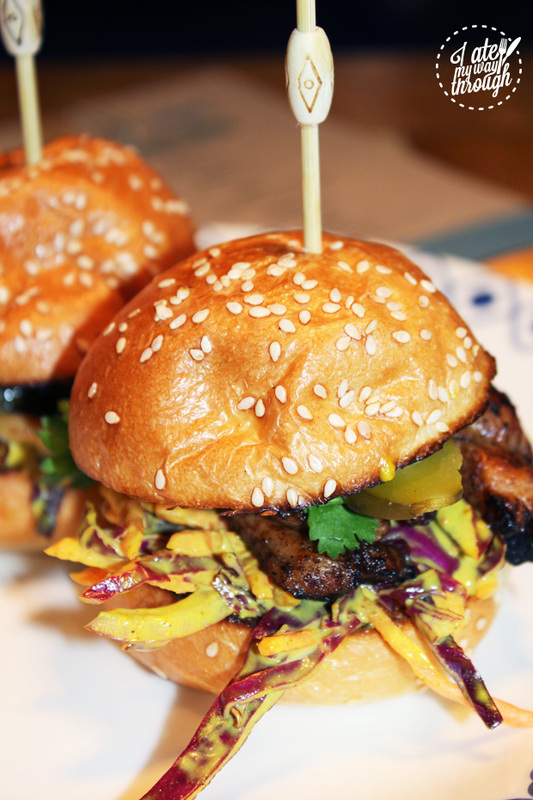 The slaw added an unexpected tang to the tender, sweet jerk chicken and the spice of the habenero. It was definitely a messy eat but I found myself licking my fingers clean when I was done just to get another taste. Despite wanting to try another of Rosie’s rum cocktails, I opted for a mocktail option since it was only lunch time. 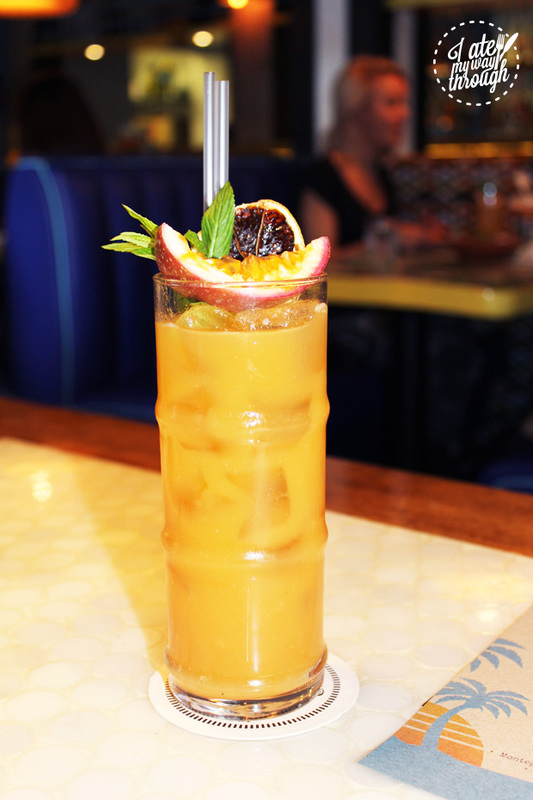 The Montego Bay Punch ($19) is originally a cocktail made from Pampero white and dark rums, Don Julio Plata Tequila, pineapple, papaya, rockmelon, sugarcane and almond. I can’t speak for it’s alcoholic sister, but the mocktail version was absolutely amazing. Before taking my first sip I imagined it to be just a regular old fruit juice, but what I tasted was so much more. The Montega Bay Punch wasn’t too sweet and was super fruity. I can say with all honesty that this was probably the best punch I’ve ever had. I can’t wait to go back and try it’s alcoholic counterpart. To accompany my meal and drink I picked a few sides to munch on. I had to grab some more of the amazing Sunshine Slaw ($6) that I loved so much in my burger. Homemade with granny smith apples, tumeric and ginger dressing the slaw was light, fresh and tangy. Of course my burger couldn’t go without a side of chips. Not being able to choose between the Chunky Sweet Potato Chips ($8) and the Jerk Fries ($7), I went with both. The sweetly spiced Jerk Fries were a great alternative to the usual salty chips one finds in most bars while the Sweet Potato Chips were extremely moreish. Both were served with a yummy homemade jerk mayo that added that little extra “something”. Miraculously I had room for dessert and so obviously I had to go for a Warm Rum Cake ($14). Served with whipped cream and coconut ice cream, this cake was perfectly tropical. 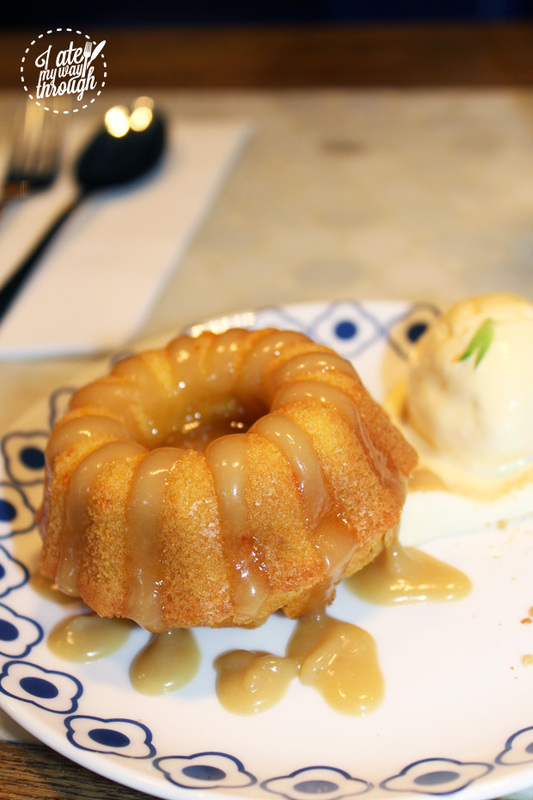 The soft sponge was moist, slightly nutty and drizzled with pool of warm rum caramel. Together with the ice cream, this cake was a great ending to my delicious Jamaican lunch. 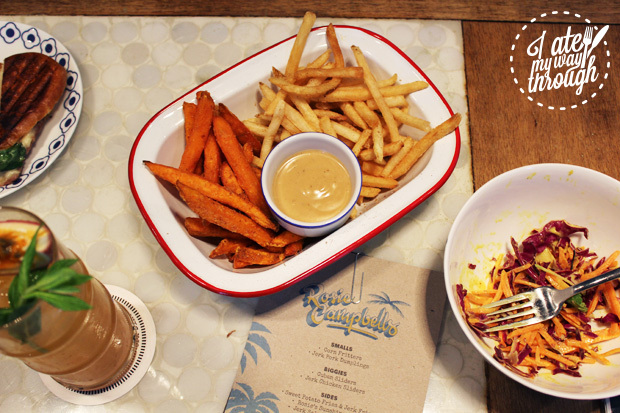 If you’re looking for something a little different to eat or drink, Rosie Campbell’s is a great place to visit at any time of the day. 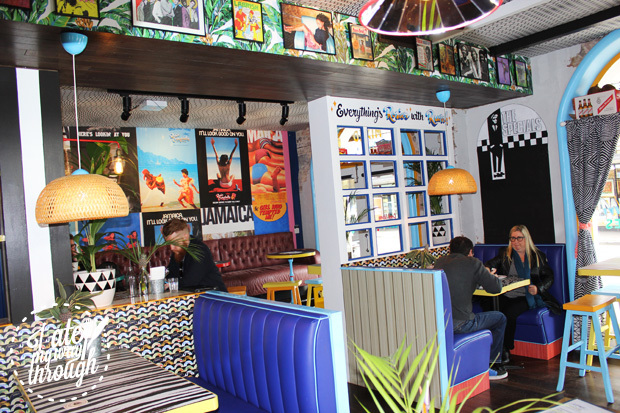 With it’s casual atmosphere, original menu and cool styling, this tropical bar is the perfect place to chill out and get your Jamaican on. I can’t wait to go back and try more of their Caribbean delights! English-born Natasha has been travelling from an early age. Formerly a fussy eater, her travels have given her a passion for food and now loves trying new things. On a student’s budget, she can often be found at home eating her Dad’s paella or at her local Thai restaurant. Lover all things spicy, Natasha also has a massive sweet tooth, which didn’t help her waistline much during her time living in France!